What’s a Residual Current Circuit Breaker? How does it work? When and where do we use it? That’s what Nasir is going to explain in this following article from his tutorial series about Circuit Breakers. Will you agree with him? Up till now we have studied the circuit breaker as safety devices which only detect the additional or excessive current flowing in a circuit. No doubt, excessive currents are very dangerous for the wiring, circuitry and the equipment which are attached to the circuitry as the load. But sometimes there is a leakage current in the circuit, which can prove even more fatal, as it deadly for human beings. So the question is that what can circuit breakers do in that case? For this purpose, residual current circuit breakers have been decide the main function of which are to prevent the shocks caused by earth leakage which can prove fatal. 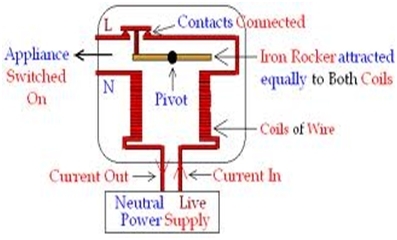 The main principle of working of a residual current circuit breaker is the detection of balance of current is its two wires, since the incoming current should be equal to the outgoing current in an electrical circuit, provided no current loss occurs in the form of any leakages or something. 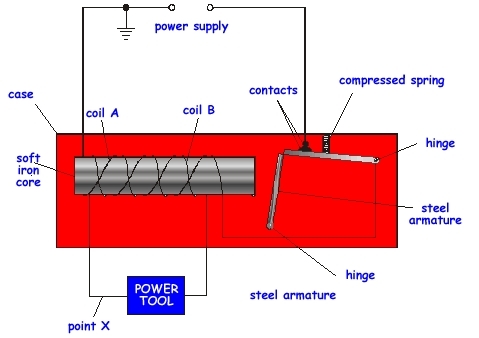 The breaker is an electrical device that detects the balance of electrical current between two conductors, by using a differential current transformer. One conductor is called the live conductor whereas the other one is known as the neutral conductor. The breaker disconnects the circuit as soon as it senses that the current is not equal in both the conductors. Now the main question is that how does this balance thing works? A residual current circuit breaker has a current balance transformer incorporated in it, sometimes a differential transformer, which has two types of windings, a primary and secondary. Along with these windings, a relay is also used for the detection of a fault signal, which is connected to the secondary windings. In case if no leakage current, the magnetization in both the conductors cancel each other and no residual magnetism is produced since it is equal in magnitude but opposite in direction. In case there is some leakage current, the residual magnetism is not equal and an imbalance is created in the circuit which gives rise to leakage flux in the core. This leakage flux induces an electrical signal which can be sensed by the relay which is attached to the secondary winding. The relay acts as a switch and hence is used in disconnecting or reconnecting the circuit. In this case when it receives the electrical signal due to imbalance of current, it immediately disconnects the circuit, hence acting as a safety devices. These circuit breakers are of immense importance as they prevent shocks caused by current leakages which can prove fatal for human beings. Due to this reason they are used in almost all the electrical circuitry in homes, offices and buildings, for the protection in case if any type of manual operation is required. This was another type of circuit breaker whose working was a bit different from the rest of the types we have studied so far. The reason for this is that the rest of the types protect the circuit whereas this is used for human protection. In my next tutorial I’m going to study the Earth leakage circuit breakers, which sound somewhat similar to these. So keep visiting the Electrical Engineering Community blog for some more very interesting stuff. or copy this trackback: http://engineering.electrical-equipment.org/electrical-distribution/residual-current-circuit-breakers.html/trackback from your own site. I’d like some examples, preferably the most likely things to happen domestically to cause these detectors to trip. What’s the most likely cause of ‘residual current’ or ‘earth leakage’? These phrases mean nothing to most people.